Building your own website is a big undertaking — fortunately made technically easy by Sandvox, but still a lot of planning is needed. Sometimes it’s a bit overwhelming to just get started. So we were happy to learn about a new book written for authors, called The Author Online. If you have written a book and you think you should create a website to go along with it, this is an indispensable guide to getting started, written by a veteran of the publishing industry. It’s not a technical reference, but a jam-packed collection of advice and ideas in getting online. This book is such a good introduction; we wish books like this existed for every other field to help people get started! If you are a writer, or even if you aren’t but you are looking for a good overview of how to approach the content of a website, you should check out The Author Online. The author of the book, Annik La Farge, is a big fan of Sandvox and we’re delighted to have teamed up with her to extend a special offer to Sandvox users: the first 50 people who sign up for her newsletter by sending an email will get a free copy of the e-version of The Author Online. Use this form to send your email, and please include the word“Sandvox” in the subject line or the body of the email. Or, if you’d rather just buy the book now, Annik is offering Sandvox users a 15% discount off the paperback and e-book versions. Just go to this special page to make your purchase. You can read a sample chapter and find out more about the book at the companion website (built with Sandvox! ), TheAuthorOnline.com. The promotion runs through Tuesday, October 12, so be sure to send your email by 11:59 PM Eastern Daylight Time on that day. If you’re one of the first 50 people you’ll receive a PDF file within 48 hours of sending your email. Every time you go to Google for information, the words or phrases you enter are called keywords. You are then directed to websites that Google recognizes as the most relevant to that search. If you have your own website, you want your site to be found — that’s a given. One way for you to increase your chances at becoming part of those search results is with the use of keywords throughout your site. But, which ones to use becomes a very important decision. A terrific — and free — tool that all webmasters should become familiar with is the Google Adwords Keyword Tool. Even though this feature is geared for PPC (pay per click) ad campaigns, the information is quite useful to anyone writing website content or engaging in other SEO (search engine optimization) techniques that can help with your site ranking, such as submitting articles, posting to Facebook and Twitter, or just trying to acquire more links. An often-overlooked benefit to this tool is the ability to determine how much competition you have for a given search phrase. Ideally you want to target keywords with a good number of searches and not too many competitors. So, if the number of searches is relatively low but if the number of competitors is even lower, it may actually be a great term to use in your page content. Conversely, if the number of searches is sky high, and the competition is even higher, it is probably wise to go after a different term. Once you figure out what keywords your website needs, you can use them not just within your content, but in your page titles and other areas of a page like the meta description and file names. You can add these keywords to a Sandvox page using the Page Details area. Have fun enhancing the keywords on your site! Go Leopards! Fight Cougars! Win Wolves! With the new “Team Colors” design from 11Mystics, you can easily build a website to match your favorite team’s color combination . You know how lively school or sports-team colors can be? Orange and Blue? It’s here. Maroon and Gold? Got it covered. Pink and Chartreuse? Well, you have to draw the line somewhere. With over 20 possibilities, you can really highlight your content. This design is ideal for schools or sports teams. Artists and musicians will really like the spirited feel of “Team Colors” as well! Head for the 11Mystics website to see if your team’s colors are available; the design pack costs $14.95. “Inspire” is a brand-new and unique offering from SV Designs with a clean, straight line approach. The ten subtle yet distinctive color selections can really give your message a boost. Delivery is enhanced by a crisp, centered image. Navigation is simple and horizontal. This is the perfect design for an individual or small business wishing to drive home a message without distraction. The supplied black and white photo banner is very attention-getting. Or you may prefer to supply your own image. Either way, your site visitors will be impressed with the sharp, professional feel of “Inspire.” Cost is $12 for the package, which includes all color variations. A step-by-step screencast tutorial. Nineteen chapters, two and a half hours. This is the latest in our newsletter’s monthly feature that spotlights a few Sandvox-created websites that we think show off the application’s features well. We hope these examples will provide some inspiration for your own Sandvox site! If you would like to have your website considered for our Websites of the Month spotlight, just choose “Submit to Site Directory...” from the Site menu in Sandvox, and fill out the details about your site (or sites). Doing so will get your website listed on SandvoxSites.com, and we may choose to feature your site in a future mailing of our newsletter. If affiliate advertising volume is your goal, take a look at ITravelAzbuka.com. Jim Schwartz utilized Sandvox Pro to develop his Russian Internet travel site. This site demonstrates the effective use of affiliate marketing on the web. His Weblog is a perfect venue for photos and promotes communication between travelers interested in similar destinations. Also, since this site essentially caters to Russian travelers, we are reminded that we all really are neighbors on the Internet. A perfect example of the “less is more” school of thought, John Worthington went with Sandvox Pro for his IT service management consulting site. 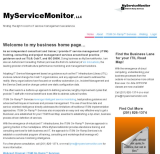 With a simple and clean content on white presentation, John has developed MyServiceMonitor, an informational site with no distractions. The site visitor is compelled to begin reading; certainly one of his goals! With the help of Sandvox Pro, Annie Jenkins of Palo Alto, California has developed a truly unique presentation for her make-your-own-soap bar. Annie has one of the liveliest sites you will ever see, as the “Trippy Bubbles” design perfectly conveys her store’s offerings. And, she is able to capture those wholesale customers looking for personalized branding as well. This site is fun, and shows the value of coordinating content with design. Annie had this to say about her experience with Sandvox: “I show this site to my friends and tell them I did it and they can’t believe it!” She has personally encouraged 3 others to use Sandvox and all are equally delighted.